I only recently discovered ras el hanout, the dynamic spice blend from Morocco. I found a jar of this flavorful blend at Williams-Sonoma. I seasoned the chicken with this and just a little salt and pepper…Oh so good! 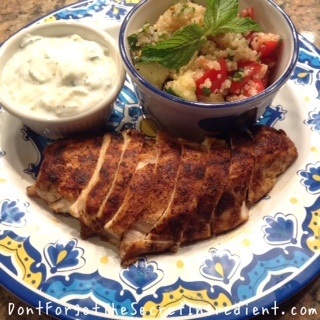 This recipe pairs the chicken with a yummy sauce of greek yogurt, shredded cucumber, lemon and garlic along with a simple but classic tabbouleh. Add 1/4 cup salted water and the quinoa to a small pan and boil on high. Once boiling,reduce heat and cover and cook 12 to 14 minutes, or until tender. Remove from heat and fluff with a fork. While the quinoa cooks, wash and dry the fresh produce. Quarter the tomatoes. Pick the mint leaves off the stems; discard the stems. Peel and finely mince the garlic or use a zester so it resembles paste. 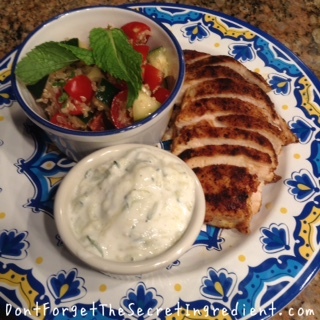 Use half of the cucumber for the tabbouleh and half for the yogurt sauce. For the tabbouleh, medium dice 1 half and for the yogurt sauce, grate the other half and squeeze if out to remove excess water and prevent yogurt sauce from being too runny. Quarter and deseed the lemon. In a medium bowl, combine the yogurt, grated cucumber (water removed), half the garlic paste and the juice of 2 lemon wedges; season with salt and pepper to taste. Pat the chicken dry with paper towels; season with the ras el hanout, salt and pepper on both sides. In a large pan, heat 1 T. of olive oil on medium-high until hot. Add the seasoned chicken and cook, loosely covering the pan with aluminum foil, 3 to 5 minutes per side, or until browned and cooked through. 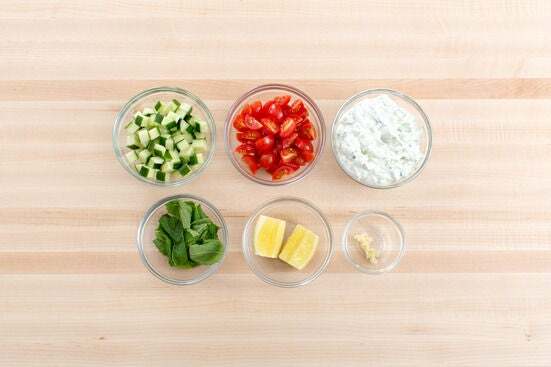 Transfer to a cutting board and set aside to cool slightly. Wipe out the pan. While the chicken cooks, to the pot of cooked quinoa, add the tomatoes, diced cucumber, half the mint (cut into small strips with scissors just before adding), remaining garlic paste and the juice of the remaining lemon wedges. Drizzle with olive oil (optional) and stir to thoroughly combine. Season with salt and pepper to taste. Finish and Plate your dish: When cool enough to handle, thinly slice the cooked chicken on an angle. Top with the remaining mint and pistahio pieces if desired. 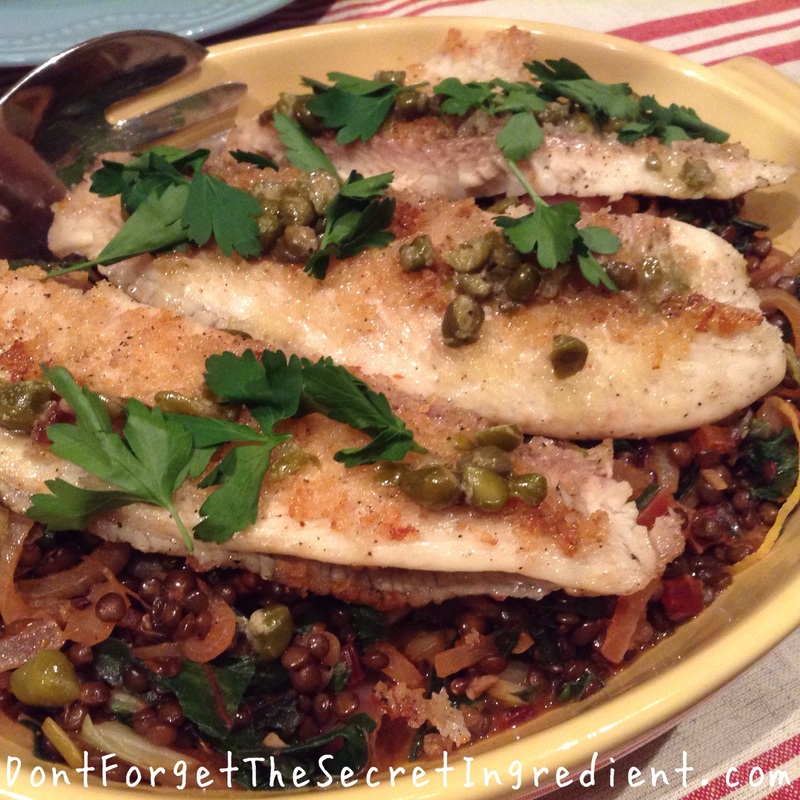 Serve with the tabbouleh and yogurt sauce on the side. Enjoy!